Hard Candy is an American cosmetics company, founded in 1995 by Iranian American sisters and Benjamin A. Einstein. Dineh Mohajer and then boyfriend Ben Einstein ( who now owns Einstein Cosmetics ) & Pooneh Mohajer (who now owns tokidoki). The company's first product was nail polish that Dineh mixed herself - a shade of baby blue named "Sky" to match her Charles David sandals. After receiving scores of compliments on the unique shade, Dineh began selling it at Fred Segal in Santa Monica, and Ben began selling to many other top retailers including Nordstroms . In that same year, actress Alicia Silverstone appeared on Late Night with David Letterman and, when asked about her pastel blue fingernails, replied, "It's 'Sky' by Hard Candy," causing an overnight explosion of the brand. Ben and Dineh appeared on segments of MTV House of Stlye program several times. A mere 18 months later the brand was quoted as generating $10 million a year in a Forbes ad featuring Dineh. Louis Vuitton Moet Hennessy (LVMH), who owns Donna Karan , Givenchy, Sephora , TAG Heuer, and Veuve Clicquot, acquired Hard Candy in 1999 for an undisclosed amount.The acquisition afforded Hard Candy greater distribution and a larger brand to attach itself to. It was later sold to Falic Fashion group, a hollywood-Florida based corporation operating on the duty-free market, and a subsidiary of Duty Free America. In 2009 Hard Candy announced a partnership with Wal-Mart to take the brand to mass. First Left : Hard ♥ Candy's "Ginormous Lash Volumizing Mascara" In (Carbon Black - 084)($6.00-$8.00) - I fell in love with this mascara the first coat! I usually have to coat my lashes 10 times to get volume and thickness. Not this bad boy! 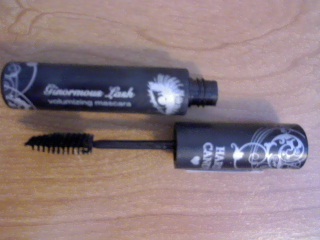 One swoop of the BIG mascara brush made my lashes VA-VOOM!. Most mascaras that i have bought in the past have flaked or smeared or caked onto my eyelashes, This mascara applied smooth and lasted me all day withought have to re-apply or rub off the smears. I have NO complaints about this mascara! Second to the left : Hard ♥ Candy's "Mouthing Off sheer lip shine" In (Au Natural - 207)($6.00) - Just the name Mouthing Off makes me smile! This lip shine is a BEAUTIFUL pink shade with a hint of sparkle. A little bit makes a casual day shine, A little bit more makes a glam night Perfect for night or day. It has a hint of a sweet sugar smell to it, Its almost hard not to lick it off your lips. 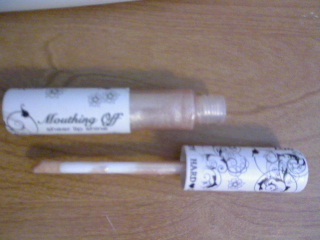 It isn't super thick or sticky like other lip shines. i Usually have to re-apply 100 coats through out the day but i only had to apply a few times during the day and that is when i drank or ate somthing. I have NO complaints about this lip shine. 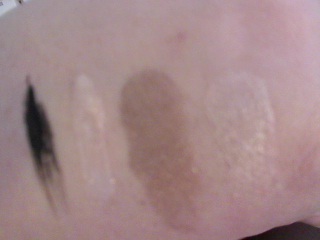 Second to the right : Hard ♥ Candy's "Kal-eye-descope Baked Eyeshadow Duo" In (High Maintenance - 064)($6.00) I ♥ this eyeshadow duo! You can down play or UP play with this shimmering eye shadow set. It's a half and half compact one side with a shimmering dark color for just a glitz of shimmering color during the day or a light shimmer during the day at school or work : Far right, or you can use both at the same time for a dramatic effect for a hot date or a night at the club, running late? and already have one side of the color on? just a quick smear of the other color and you are good to go girl! The cute case it comes in is sure to make your head turn! 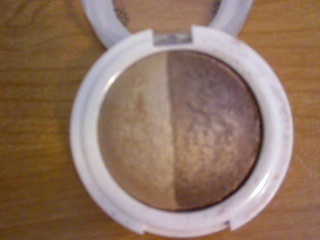 I have NO complaints about this eyeshadow duo! Can you hear that sound in the background. Sounds like Angelic Harps. 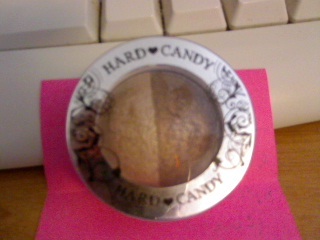 I have always have a mad love for Hard ♥ Candy Makeup Products. I was a pre-teen when I first started hearing about these glamourous makeup products for girls. I was never able to buy the products because i was a pre-teen i was not able to work, and my mother never had the meanings ( Credit Card ) to buy it for me. And as living in a small (SMALL) town she was never really big on the big city of (Tulsa,Ok) and that was the only location to buy products such as "Hard ♥ Candy" makeup withought buying it online. So i was SUPER EXCITED when i heard back from "Hard ♥ Candy" about sending me products to try! I seriously had a mini heart attack. Took me a lot of years waiting to try this outstanding product but....It was worth the wait!!. Hard ♥ Candy is now being sold at mass-merchents such as walmart around the world for around ($5.00 - and up). Let me tell you these girls now a days have it so easy. I was a fan of hard candy then, And i'm a HUGE hard ♥ candy fan now!